Trikes and (odd) bikes. : 23rd June 2018 A sudden burst of activity. Saturday 23rd 55-60F, 13-15C, rather cloudy and windy. Just a brisk, 40 minute walk to the village and back. Late morning ride to the more distant "Saturday" shops. Cruising at 20mph going most of the way with a decent tailwind. The cycle paths are now compete and smoothly surfaced along with the road. The drains covers are all a bit low. With one sunken drain, directly in the middle, in a sharp dip, right at the beginning of a major new section. I tried chasing a tiny, blond person on their racing bike, coming back. On the drops, heading straight into the headwind, but they rode away from me. Don't you hate it when that happens? 17 miles. Sunday 24th 55-71F, 13-22C, grey and breezy. Cool too! A Red kite was hunting low over a grain crop. It kept dropping as if to catch something but gave up in the end. It gradually brightened up as I was sent on a hilly ride to a village garden center. I seemed to be carrying a mobile headwind with me wherever I went. Quite a few cyclists were out training or just enjoying a ride. 26 miles with a detour for shopping on the way home. I left the Abus, Dreadnought Class, Mini-U lock behind and rode up the hills as if I had helium in my tyres. I may offer the lock to Mærsk Shipping as an anchor for one of its vast freight carriers. If they can't use it they could always scuttle it offshore to act as an artificial reef. It's a shame they don't scuttle Abus as outdated and unfit for purpose. My front gear changer had slid down the seat tube slightly. Making it impossible to change gear onto the bigger chainring. I couldn't be bothered to stop and adjust it because all the gears still worked on the small chainring. I'll put the trike up on the workstand and fix it properly while it is at eye level. Job done. Don't ever order a frame with a steep, seat tube angle. Front changers are supposed to fit on average seat tube angles. On my 75° seat tube the cage is kicked up at the back. So the cage is no longer concentric with the chainwheel as it should be. This makes changing uncertain because the normal geometry for lifting the chain over is completely wrong. It takes place far too late/forwards on the chainring. The chain just hits the side of the teeth instead of being gently lifted much earlier. Filing the clamping ring would improve the angle of the changer. So I clamped the ring to a scrap of plumbing pipe to hold it steady. Five minutes work with a file and the angle was improved. There is some styling "flare" to the outer cage but the inner blade is now far more concentric with the chainwheels. I put the trike back on the workstand and the change up to the larger chainwheel did seem far less brutal that before. It often used to throw the chain right over the outer chainwheel and onto the crank. Any less outward throw adjustment and it simply wouldn't change upwards! I really need a new 10sp chain but have put it off due to the recent lack of miles. 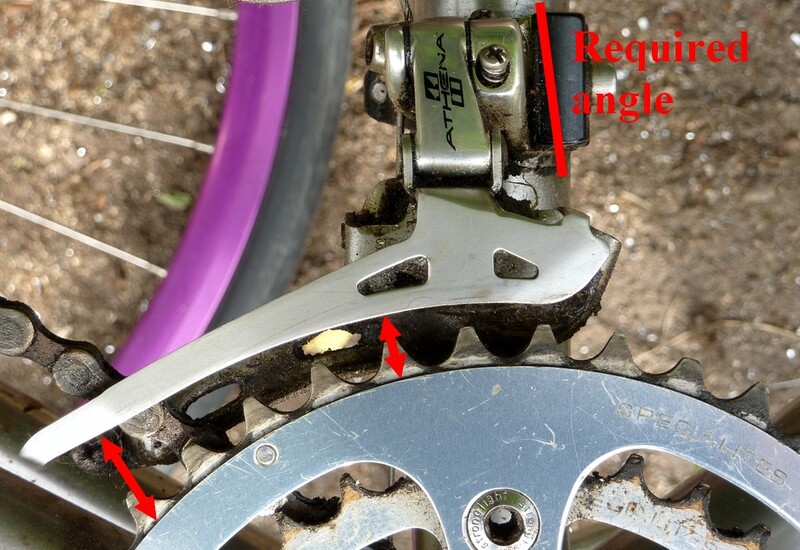 There is no need to buy an 11 speed chain since the 10sp fits the 11sp rear sprockets just as well. The TA rings are marked 9-10 speed and never gave any problems.